Is there a time when an indoor track event should be stopped to help a fallen runner like Komey Campbell? Is there a situation when a race on an indoor track should be stopped when a medical emergency happens to one of the runners? If something happens to a football player on the field, the game is stopped so full attention can be given to the fallen player. There seems to be a protocol in place for such situations. If there is a medical situation at a road race, 911 is called and a medical team is there on the spot normally within minutes. There is normally plenty of space on the road so the race does continue and the fallen runner is given full attention by the medical team. Indoor track is a different situation. The space is more cramped and unlike a road race, runners are passing the same spot every 29 to 35 seconds or so. Being on an indoor track is like being on a busy freeway compared to being on a country road. 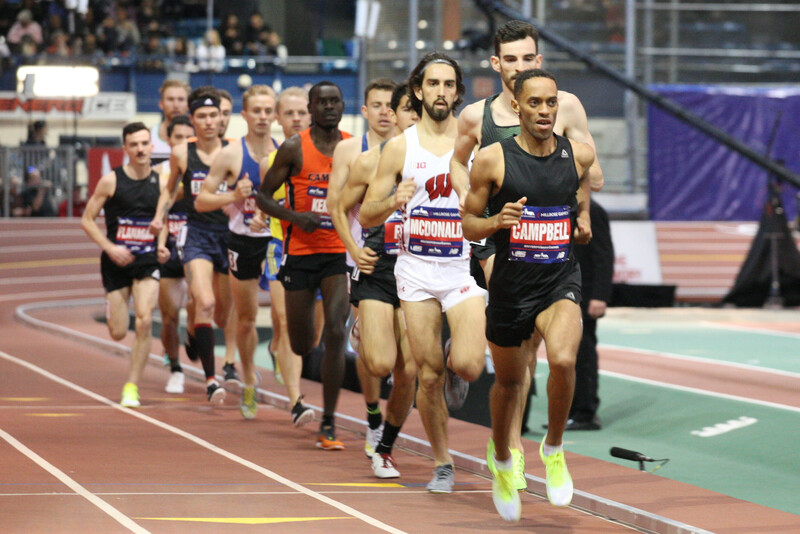 On Saturday Feb 9 at the Millrose Games in New York City the pacer, Kemoy Campbell for the men’s 3000 went down early in the race. Larry Allen who was watching from the stands describe the scene. “The 3000m pacer, a Jamaican 2016 Olympian at 5k went down very suddenly right past the apex of the first turn after about 1000m and landed just off the track surface on the infield. He was clearly unconscious when he landed,” wrote Larry in a text. “He was down for 23 minutes (by news reports) and never moved a muscle. It took at least 2-3 minutes before anyone administered any medical help and then according to my Doctor friend, watching the meet with me, the mouth to mouth resuscitation efforts aren’t the current protocol. “CPR was crucial and it was a couple of more minutes before it was administered and according to my friend (in real time) the only thing that could’ve really helped was a portable defibrillator and I learned that it must be administered within 5 minutes in order to assure oxygen supply to the brain is maintained. “It was 7-10 minutes before he was shocked. There were a series of different people that attempted to resuscitate him by cpr (& mouth to mouth) before (and after) his heart was shocked. “There is a major hospital (Columbia Presbyterian) right outside the armory on that side and it is ultimately where he was taken. News reports today indicate that he is in the ICU in a medically induced coma. “It was traumatizing to witness up close. My friend wanted to climb down from the balcony to try and help but there was no real way for him to get down and the back up over the banked track and fence along the top. He was and is tormented by his inability to be in a place to offer help,” Larry concluded. This article is not meant to bring blame to anyone or any organization. In all the years I have been following track I can not recall a similar situation. I am sure no one would have ever dreamed that something like this would ever happen. This was a well conditioned athelete and a runner qualified to pace such an elite field. It should not have happen but it did. The scene was very distributing for all of us there Saturday afternoon at the Games. In my thinking it just makes the performances after the event even more amazing. It is hard to imagine that Yomif could have 100% blocked out the traumatic scene that had just unfolded. But maybe since he does not speak English he did. In any case he almost set a new world record for the mile just 20 or so minutes after Campbell was removed from the stadium. It was an amazing race to witness up close and personal right at the finish line however there still was somewhat of a fog hanging inside the arena. There is a question that should be addressed. Should the 3000m race have been stopped so full attention could have been given to the down runner? As it was, runners kept flying past him for several critical minutes making it more challenging for medical personnel and equipment to be at his side. We hope that Kemoy Campbell will be able to have a full recovery. Our hearts go out to him and his family.